Today I headed to chemo with yet another friend. I’m a chatter, so taking along a friend is fun. There are a couple of private rooms at the infusion center, and we try to snag those when we can. I always worry that we’ll have too much fun and all our chatting and laughing will bug people who are sicker. Or grumpier. Yesterday I ran into the social worker who runs several support groups at the cancer center. She noticed that three young women with breast cancer would all having chemo at about the same time today, and so she had asked that we all be put in the same common room. Michelle was one treatment ahead of me on the same chemo schedule, and the French girl (yes, she’s French, and no, I don’t remember her name!) was on her first treatment. The French girl and I were able to hear all about what to expect from surgery from Michelle, who’d opted to do that first. And Michelle and I were able to let the French girl know what was coming from chemo. She was glad to hear how well we were handling chemo, and it clearly relieved her aunt, who had come with her. Both of the other girls there were a little younger than me and were unmarried without any kids. 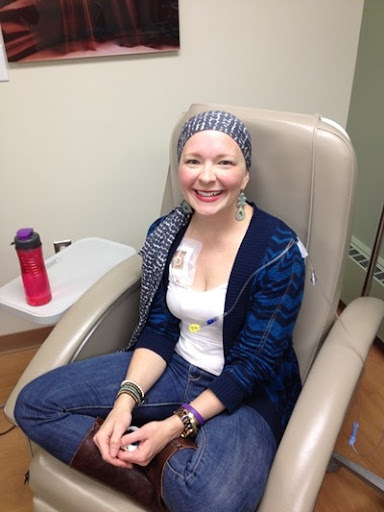 A big decision young women face before starting chemo is whether to save their eggs. Chemo throws you into menopause and probably wrecks your eggs even if you bounce out of menopause post treatment, so saving eggs is necessary if you want to have biological children. Both of these women had opted to forgo egg harvesting knowing that it would involve a lot of hormone injections and a painful surgery and would delay cancer treatment. It was so wonderful that the friend I took along had been through IVF treatments and so knew all about what they would have faced with the egg harvesting. She was able to tell them about her experiences and the adoption of her son, encouraging them that they had made a good decision. So while I know I’ll probably check the availability of the private room again, I’ll make sure that I pop out to check on my new friends, too.